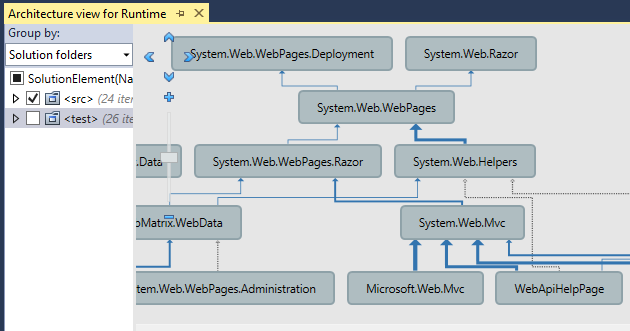 JetBrains introduced Architecture tools in Resharper 8. It lets you visualize dependencies between projects and types. This entry was posted in Tech on March 31, 2015 by pavel. Human civilization history dates thousands of years. Archaeologists strive to investigate fragile clues of former cultures in order to better understand the past. It is not easy to do because many artifacts are partially or completely destroyed. It would be a mistake to think that only archaeologists deal with information loss. It is as easy to lose information about systems and organizations which were built quite recently, just a few years ago. In “Institutional memory and reverse smuggling”, an engineer tells a story about a petrochemical company where knowledge about plant design and processes was lost after decades of operation, and they had to bring in a former engineer to smuggle the knowledge back to the company. This entry was posted in Tech on March 15, 2015 by pavel. Even if you had perfect database design from the start, it is likely that requirements changed, and you have to change database schema accordingly. As there is legacy code, there can be legacy data, with schema designed for use cases which are no longer actual. It is usually harder to fix data design than to fix code design, but it is doable. And as with code, you can apply refactoring techniques: improving the design without change in behavior. A book “Refactoring Databases: Evolutionary Database Design” describes basics of database refactoring and lists different kinds of changes to relational databases. It starts from explanation why refactoring is a good thing, why it is important to make small incremental changes, and which organizational obstacles you can get on the way of implementing these techniques. You can imagine how hard it can be to make database changes if DBA and application developers are in different teams, and any database change requires coordination between these teams, sometimes using strict change management process. Basically, agile methodologies with their focus on cross-functional teams and short development cycles can help here. This entry was posted in Tech on March 8, 2015 by pavel.